No matter how clever it is to put you and your intended’s initials on glass jars filled with fancy bath salts and topped with wax seals and fuses — “T” and “T” becomes “TNT, get it? — it’s not a great idea if you’re headed to the airport. See, the Transportation Security Administration can’t let something labeled as an explosive through without thoroughly checking things out, which, in this case, turned into an evacuation of the Denver International Airport. 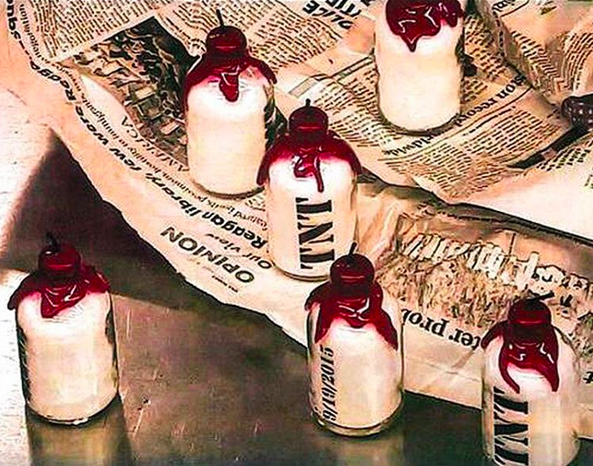 It’s unclear when exactly it all took place, though we’re guessing right around Sept. 19, according to the wedding date on the bottles’ labels, but the TSA posted a helpful reminder with an image of the wedding favors on Instagram yesterday, reminding folks to “be mindful” of what they’re traveling with. Because while it could appear quite innocent when you explain what’s going on, bottles filled with powder and topped with fuses are going to look different on the X-ray monitor. Again, congratulations to you, T and T, may your marriage be explosively happy. Just don’t fly with fake bombs anymore.